The Grape Kingdom is the eighth kingdom in Donkey Kong Jungle Beat. In the original version of the game, it is the fourth kingdom linked to the K Barrel and can be accessed by completing all the kingdoms linked to the D Barrel and collecting nine or more Crests. In the New Play Control! version, it is the second kingdom linked to the J Barrel and is accessed by completing the Lemon Kingdom. The Grape Kingdom is the dominion of Grave Tusk in the Nintendo GameCube version of the game, and Hard Roc in the New Play Control! version. At the end of every level, Donkey Kong eats a giant grape bunch. Sweet Paradise is the first area of the Grape Kingdom. 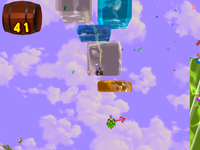 The level takes place in the high up in the sky. There is very little solid ground in this level; Donkey Kong navigates through the level primarily by swimming through a strange colored liquid floating in the sky. There are many small sections of this substance all throughout the level, as well as Helper Monkeys, who assist Donkey Kong by throwing him into higher areas. There are a few meteors in this level as well, but they only appear at the end of the stage. It is possible to finish this level without ever touching the ground; doing so and avoiding taking hits is the key to obtaining a large amount of beats here. Primeval Ruins is the second area of the Grape Kingdom. The level is quite dark, but Donkey Kong can send out a sound wave to create some light. There are some Bakkies in this stage who glow in the darkness when hit by a sound wave, as well as many large, moving platforms. Primeval Ruins also features a few Dragon Slots, which carry him to new areas, and Helper Monkeys also fill the level, teaming up to form ropes for the ape to swing on. 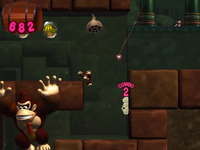 Normal Helper Monkeys also appear in bushes to throw Donkey Kong to higher areas. A Rolling Frog can also be encountered at the end portion of this level, and it blocks the way through a tight passage. In the GameCube version, Donkey Kong must face Grave Tusk, who looks exactly like Turret Tusk, but is colored brown. He is fought in a desert-like setting. After losing enough health, Grave Tusk gains a new attack: a laser attack that is fired from its trunk. When defeated, Grave Tusk falls apart and deactivate, much like the way Turret Tusk is defeated. In the New Play Control! version, Hard Roc is faced. He looks like the other Rocs, but is colored a light grey. Hard Roc is fought in a setting much like the other two battles, but there is a larger stone column, Banandelions, and two Helper Monkeys. He attacks in the same way his predecessors attack, using their attacks as well. 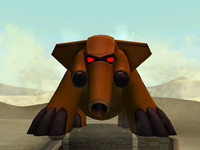 After he loses half his health, Hard Roc gains the ability to fire three Shadow Meteors at once, as well as the ability to fire a shadow-like creature. 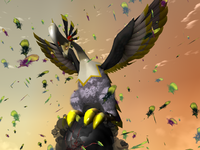 Once defeated, he explodes, and feathers fall to the ground. This page was last edited on April 12, 2019, at 13:13.